Well, what a week huh? Two series victories. Two Zito gems. Matt cain was nearly perfect. MadBum bounced back. Timmy sucked again. Nate took over the right field job. Melky kept hitting. The Giants were the only team to score at least 4 runs in each of their first 8 games. Oh, and something about Brian Wilson. Dang. This guy is probably going to be our closer. Here are my thoughts on the closer situation. Several people are already talking about what to do with Wilson next year. It’s an interesting convo, but not one I want to have right now. Here’s what I would do: go closer by committee until someone establishes themself (I agree with Baggs, I think, ultimately, Affeldt is best suited to do this if he can get himself together). I would not make a trade! The Giants also have a potential wild-card/secret weapon in the minors right now in Heath Hembree. I don’t think he should come up and close but he could be a K-Rod type addition to the bullpen late in the season. Here’s what I think the Giants will do. Go with a closer by committee until someone establishes themself (probably Casilla) and then make a trade at the deadline for an “experienced” closer. Top targets will be Joel Hanrahan, Carlos Marmol, and Brandon League. The way closers are going down this year those guys are going to be in high demand. Which means they will be costly. Which means the Giants will burn somebody worthwhile (Belt? Panik?) for them. A classic Panik move. Ha ha. On to the honors! 4 Giants hit over .300 this last week. Those hitters are: Melky Cabrera, Emmanuel Burris, Brandon Crawford, and Nate Schierholtz. How about that. Having pointed that out I’m going with my new favorite Giant: Hector Sanchez. I can see why the Giants dumped Whiteside and sent Stewart down. In a year when they are not sure what kind of offense they might get out of second base and short stop, they could not afford to have another black hole in the line up when Posey sits (which he needs to do). The kid can hit and he can play D too. Love it! How do you not go with Matt Cain. Dude goes the distance, only giving up 1 hit (to the pitcher), strikes out 11, and yet he’s not the POW. Barry Zito, well done sir! This might be the only time he gets in here, so let’s point out that he Giants are 2-0 when Zito starts. That’s 50% of their wins. He shut out the Rockies in Denver to stop the bleeding, and then he backed it up with a very quality start at home. Who knows how long this lasts, but its worth honoring this week. 3 at home against the Phillies. This will be an interesting series. The Phillies are a diminished team right now, but the Giants will have to beat Halladay and Lee. Let’s hope Timmy bounces back and we get 3 pitching duels. After that, it’s off to the East Coast for 3 against the Mets. Stay tuned for some thoughts from Nick later today. Going in to the way back machine (which for this blog is only two months) I suggested the Giants try to ship Barry Zito to the Yankees in the fallout from Cliff Lee going to the Phillies. You can read about it in this post (but you have to read carefully to find it =). Today Jonah over at Fangraphs makes the argument that this is actually what the Yankees should do! I apologize for the self congratulations. Speaking of crazy ideas/rumors. 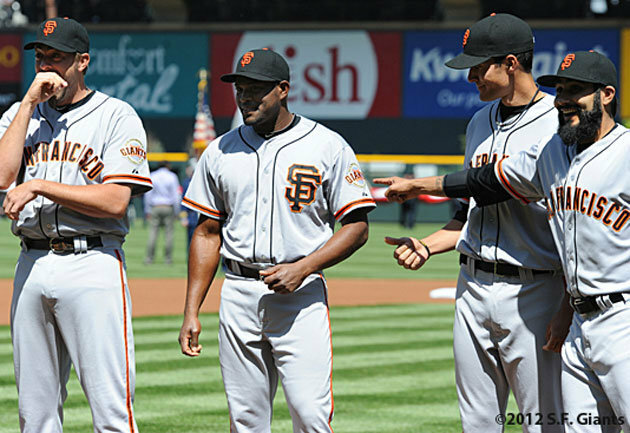 Grant at McCovey Chronicles suggests now is the time to trade Brian Wilson. The BW hype machine is in full effect with his recent appearance on George Lopez, his video game, and his return to twitter. Would you trade B.Wheezy if you could get a good young shortstop back? Definitely some conversation starters out there on the web today!